It is also a great way of improving your visual memory, then in such a short time it is not possible to finish a bigger piece. 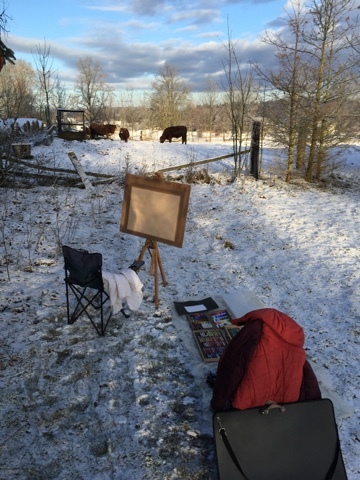 I got used to spend around two to four hours outside with two easels. Some more hours are needed to finish the paintings later in my warm studio. I prefer to work on two pieces at once because of the layers. As I fix the layer on one piece, in that very cold air it needs longer time to dry before I can continue to paint on it. 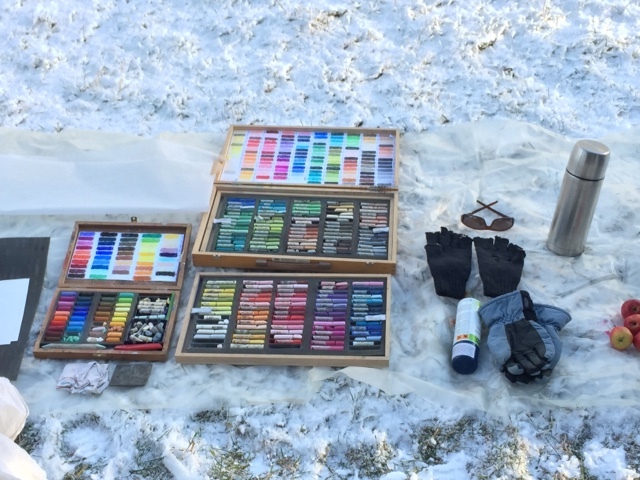 I use two sorts of pastels - Rembrandt and powdery Sennelier. The fixative is from Schmincke. Sunglasses if the sun shines on my paper. Paper of course! I prefer Canson. Two easels with support for the pastel selection. A clipchair to have my lunch and warm tea. I work standing. Solid light plastic mate 2x1 m as the underlayer for my tools. It is not easy to find a pastel stick in the snow. A portfolio over shoulder and transparent papers to preserve the paintings. A bag on on the wheels to carry it all. And camera to take the picture before I start to paint. If you have any questions, dont hesitate to write me an e-mail!